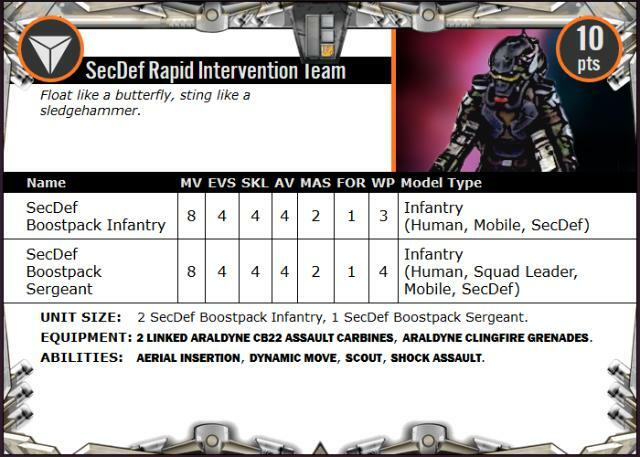 Last week saw the release of the awesome new plastic Secdef to bolster the Epirian battleline with some elite military muscle. If you missed it, you can see the release article here: https://www.facebook.com/maelstromsedge/posts/2244261785589396, and you can also find an assembly guide here: http://www.thecommguild.com/roller/thecommguild/entry/assembly-guide-epirian-secdef. This week, I'd like to go through some quick and easy modeling ideas to tweak your models. Novice modelers, fear not - nothing here requires extensive conversion experience or special tools! 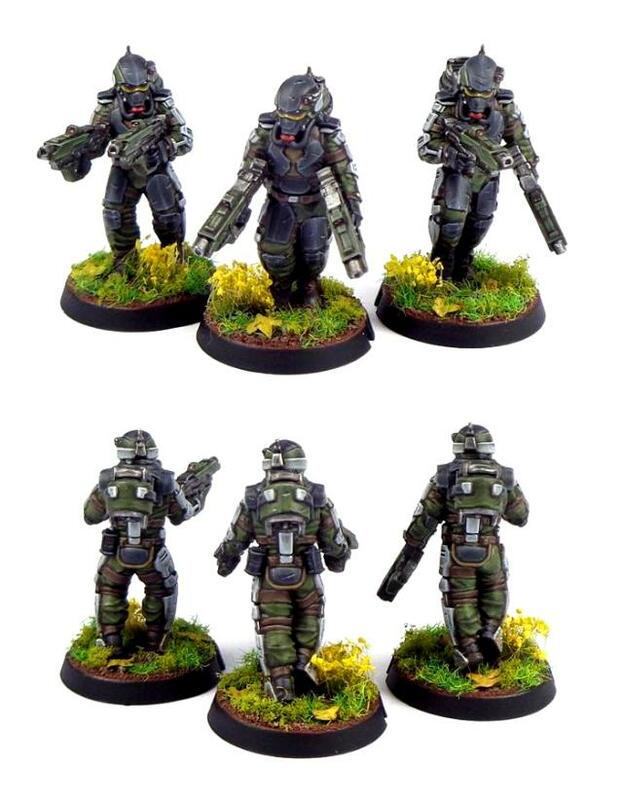 To (ahem) kick things off, you may have noticed in the assembly guide that the sprue comes with 3 sets of legs - one in a walking pose, and two slightly different standing poses. The left and right legs from each pair have matching locator pins to help them go together neatly, and these are different sizes for each pair to help you keep them sorted during assembly. You can easily mix-and-match the pairs to create some variation in the posing, though - the smaller pins will fit into the larger locator slots, and for pairings where the locator pins don't fit in you can just cut them off with a sharp hobby knife and glue the hips together without them. One of the ongoing design goals for the Maelstrom's Edge range has been for the various kits to be compatible wherever possible to enable parts swaps. 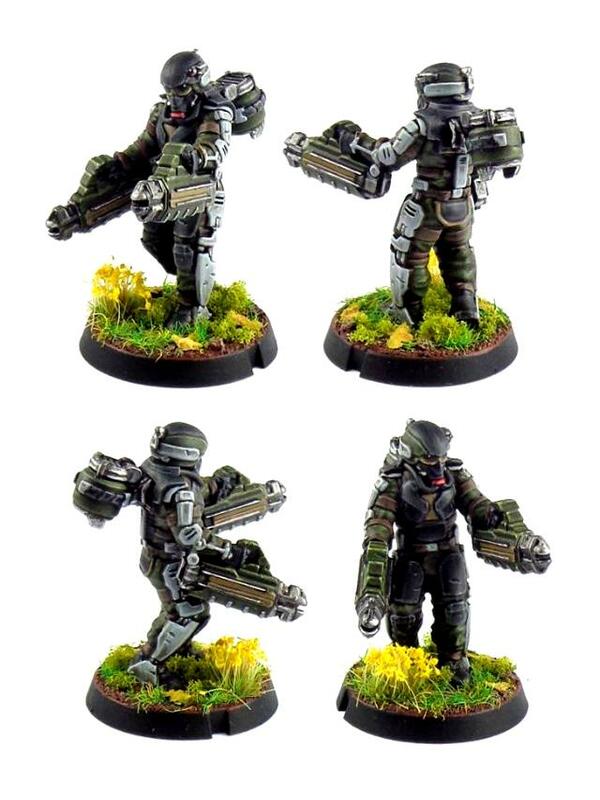 This is particularly useful for increasing the pool of available heads for any unit, and the open-hand design that has been adopted for weapon arms likewise adds extra options for switching gear around. On the below models, some slightly more hi-tech than usual Contractors have been made by using Contractor heads and weapons on the Secdef bodies. 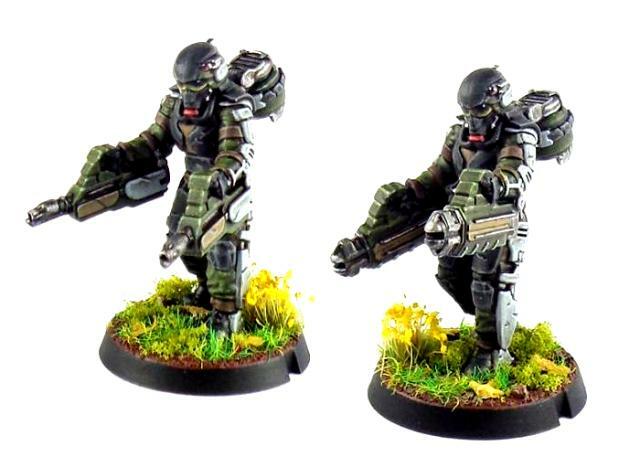 You can also use heads from the Broken Infantry sprue to add unhelmeted human heads or aliens to your Secdef's ranks. For an enclosed helmet option, you can use a spare head from the Epirian Bot Handler sprue. The left arm on the above model has also been modified, removing the pointing hand at the wrist and replacing it with one of the open-palm left hands that normally hold the Secdef heavy guns. The heavy weapon arms are also useful for putting on Sergeants to show tactical hand signals. 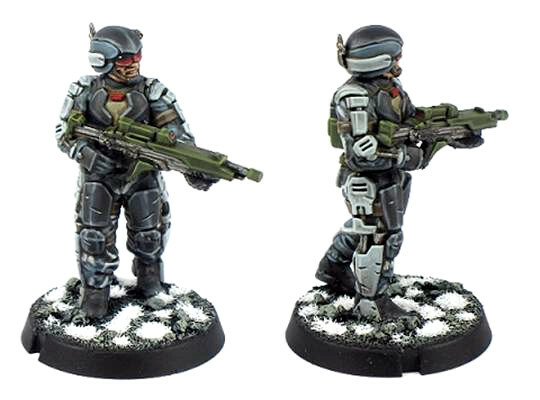 Secdef troopers are equipped with a G20 pistol along with their assault rifles, although this isn't included on the sprue. As with other pistol and grenade options that come as standard on various units, there's no specific need, rules-wise, to show these. 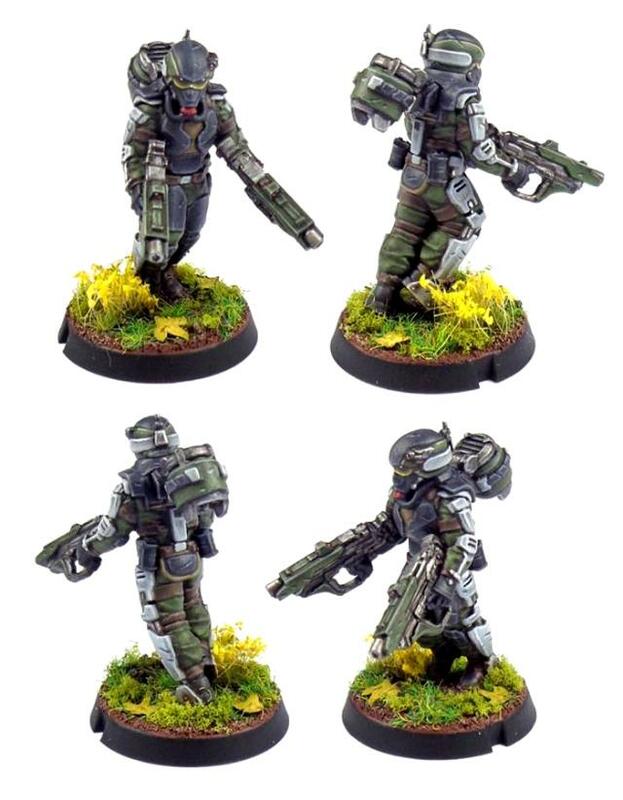 If you do want to show the pistol, though, the G20 is a variant of the standard Epirian Guardian pistol, so you can use the pistols included on the Contractor sprue to represent them, as has been done on the 'Lieutenant' model below. Finally for this week - While the designs are slightly different, the strength-boosting exoskeleton makes Secdef legs similar enough to the legs of the Master Bot Handler that you can make a walking Master Handler by simply swapping in the Secdef legs for the normal Master Handler legs, as below. 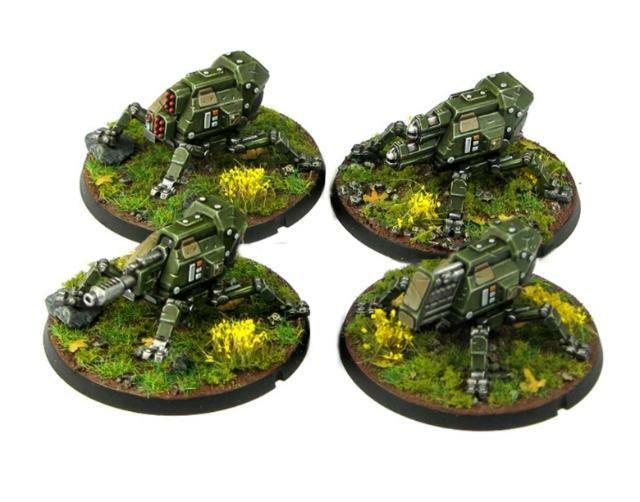 I couldn't resist also taking the opportunity to replace this Master Handler's usual weapons with a modified pair of CG100 Chainguns taken from the Secdef sprue. 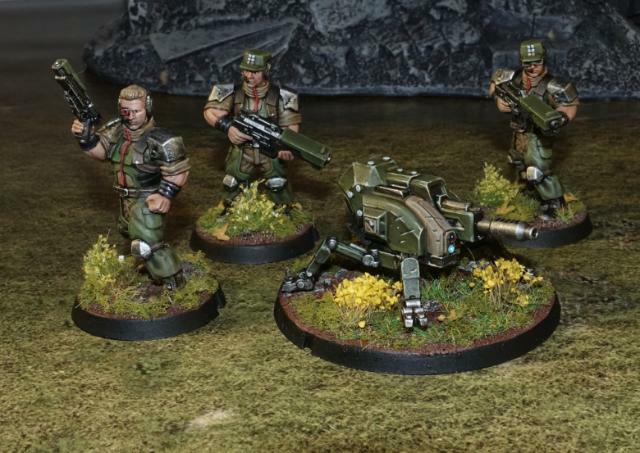 What have you done with your Secdef troopers? We would love to see your creations on the Comm Guild Facebook page! 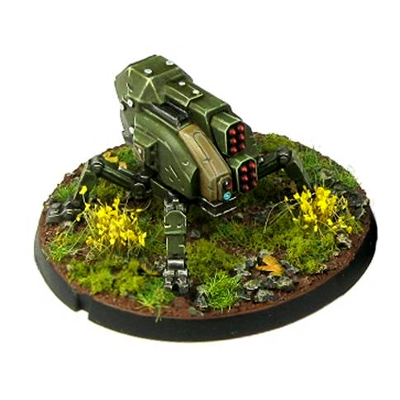 To pick up the Secdef sprue, or any of the rest of the Maelstrom's Edge model range, visit the webstore here. I've been having an awful lot of fun playing with the new Epirian Master Bot Handler kit (as evidenced in the Modeling Spotlight article from last week. 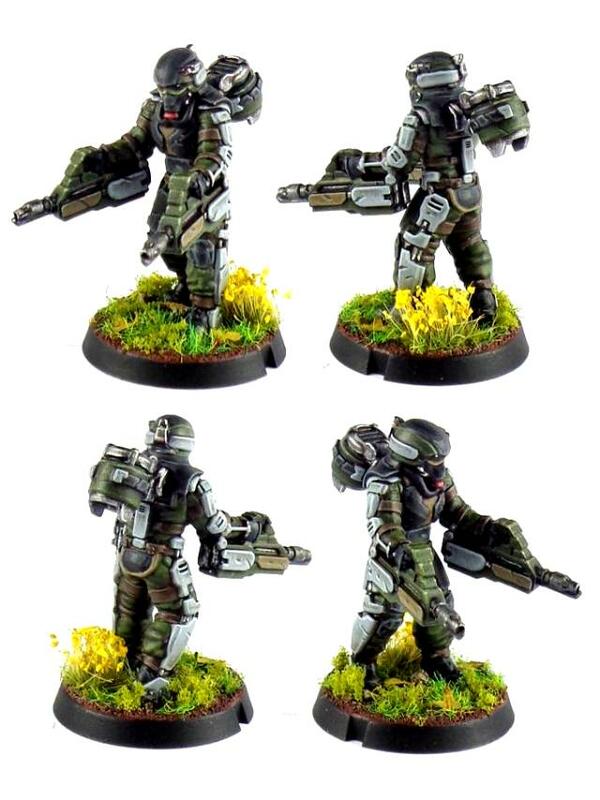 Amongst all of the other conversion ideas that popped up when I started looking at the sprue, I had one that I thought warranted a conversion article all of its own. And so, let me present Konstantin Moor, Veteran Bot Handler, along with his companion drones: Iago and Cassio! 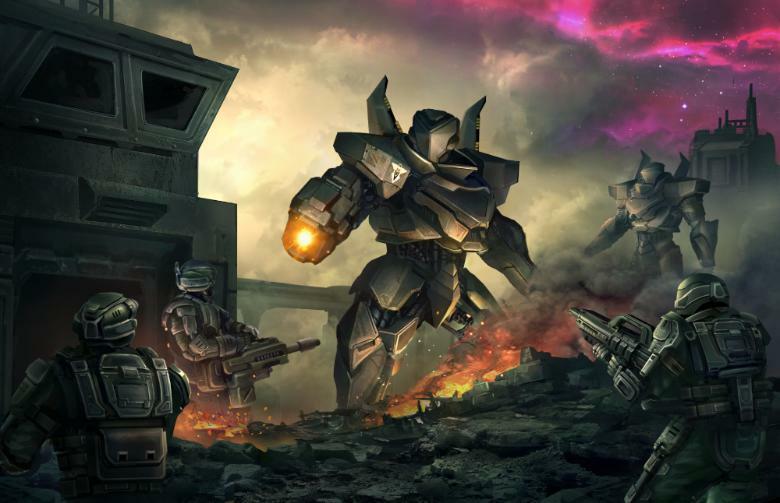 The main things that set Konstantin apart from his brethren are the additional pair of weapon arms, and the independent movement of the weapon arms, as opposed to the normal direct control rig that links to the forearm. 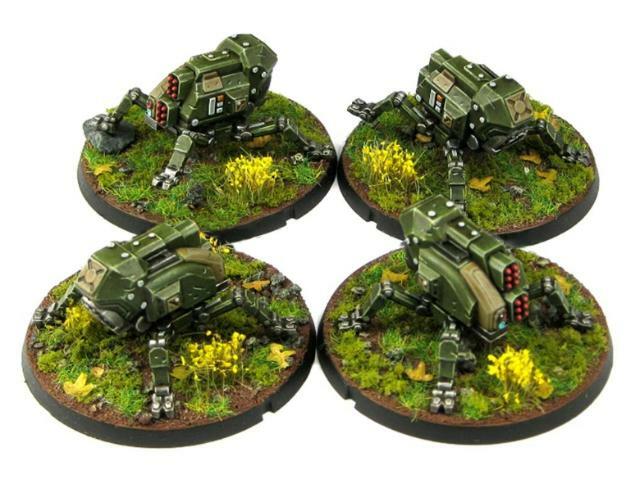 To replicate this build, you will need two Epirian Master Bot Handler sprues and the Faction Expansion Sprue. You will also need a Drone sprue to build Iago and Cassio. I built the body as normal, using the bent legs and the matching torso. In place of the normal helmeted head, I used the bare head from the Faction Expansion Sprue, although there would be nothing stopping you from just using the normal head if you prefer the armoured look. Note that the head from the expansion sprue is designed to go with the Karist Trooper torso, and so has a slightly thicker neck than the various Epirian and Broken heads. As a result, the neck needed a little shaving down with a hobby knife before being glued in place. The arms were largely left alone, with the only modification required being to chop off the mounting peg for the weapons. Now for the fun part. I took the backpack, and underneath the existing weapon arm socket, I smoothed down the corner of the pack and drilled a small guide hole with the tip of my hobby knife. Then I found a drill bit that matched the diameter of the arm socket (11/64", although a 4mm bit would do the job for the metric-inclined) and drilled out a new arm socket. I did this with the drill bit held in my fingers and twirling it - you could use a dremel or similar rotary tool, but plastic is soft so there's not really any need when the drill bit is large enough to grip it securely with your fingers, and this helps to reduce the risk of accidentally over-drilling the hole by drilling too fast. Next up I assembled the two sets of weapon arms and glued them with a bit more than a 90 degree bend in the elbow. These were glued in place on the backpack, and the backpack and arms glued onto the body. I also glued the Neural Nodes in place on the backpack weapon ports. Konstantin is armed with two linked sets of Drone Class Laser Systems. Without these being joined to the forearms, I wanted to change how they mounted onto the weapon arms a little, to give them a more open range of movement. Using a hobby knife, I cut through the rear half of the mounting ring off the back of the weapons. The cutoff piece was also cut in half. The weapons were then glued onto the ends of the weapon arms, pointing directly forwards with the remaining half of the mounting ring socketing over the ball joint. I attached one half of the cutoff ring section on the outside, to reinforce the joint a little. After one final tweak (repositioning the right arm to be extended forwards instead of down) Konstantin was assembled and ready for paint! Iago was assembled as a concept for the Master Handler modeling spotlight article, and I liked the idea too much to not get him onto the table. To put him together, I used a Spider Drone and a Master Handler backpack with Cluster Missile pods. The bottom protrusions were sliced off the backpack with a razor saw, and the back of the drone chassis was similarly cut down flat. I then glued the backpack onto the back of the drone chassis. The chassis sidepods needs shortening a little - I cut them down so that they butted up flush against the backpack. With the addition of a set of Spider Drone legs, Iago was all set. Cassio is based on a Firefly Drone, with the normal laser system replaced with an energy field projector. To create the projector, I used a flakk gun from the drone sprue, cut as below, and the muzzle of a radwave emitter and a cybel mine from the Faction Expansion sprue. I assembled the drone as normal (sans weapons) and then glued the projector in place underneath, using the cut-down flakk gun as the mount, gluing the cybel mine to the front of the gun, and then the reversed radwave emitter muzzle to the front of the mine. With turbines glued on and a flight base added, Cassio was ready for action. Next week: painting and rules card!